Recently while playing on twitter, someone asked a question that got us thinking (we know, rare occurrence), and rather than just shoot from the assumptive hip, we went about looking for an actual factual answer. Taking some time to talk to a couple local winemakers the answer became clear as mud (technical term). The question is 'how does a consumer know how much residual sugar is in the wine they are drinking?' Well the simple answer is, read the label. Righty o there smart arses you say. 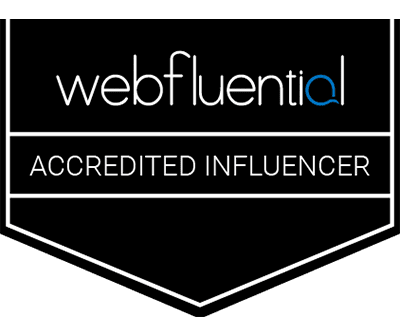 So what is residual sugar and how is it measured? First off, residual sugar concentration is expressed in grams per liter (g/L) or as a percentage of weight to volume. For example, a wine with 0.2% residual sugar contains two grams of sugar in a liter of win (bottle is 3/4 liter or 750ml). 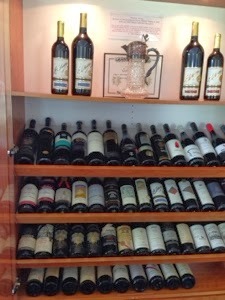 Dry wines are typically in the 0.2–0.3 percent range, off-dry wines in the 1.0–5.0 percent range, and sweet dessert wines in the 5.0–15 percent range. (got to love the metric system) Sounds simple right? Well as a measurement it is, but where things get murky is in determining actual real world percentage. There are a number of ways residual sugar can be measured. But wait. Returning to our initial question, what is residual sugar? We’re now faced with the question of which types of sugar are going to be counted in this residual amount. Wait, what, this was going to a simple story on measuring something as simple as sugar when in reality we need to determine what is being measured, simple put it in your coffee sugar, or, glucose, fructose, sucrose, pentoses or are we just talking about sugars that yeast can ferment? Blimey Charlie how easy was it to go down that rabbit hole? Of course next up it depends on how residual sugar is to be measured. The most common way to measure sugar in wine only measures reducing sugars like glucose and fructose, but not sucrose. In most cases that means that all of the sugar in the wine is being measured, but there is a notable exception: chaptalization. When winemakers add sugar to must, they often add it in the form of sucrose, or more simply, stick it in your coffee table sugar, because sucrose is cheap. If the yeast dose not digest all of that sucrose (after breaking it down to its component parts, glucose and fructose), the wine may contain more sugar than the standard measurement would suggest. But we digress. So there is another big, huh? Next up there is the term Brix. This is a term that is used for expressing sugar content in grape juice but generally not wine and the first tool often used to measure sugar is a refractometer. A drop of juice is placed on a quartz surface at one end of the instrument, and you look through the sight glass on the other end. The sugar in the juice will cause light to bend at a certain angle, depending on the quantity. The refractometer measures this angle and contains a scale corresponding the the quantity of dissolved sugar in the mixture. Simple, and often used to help determine when grapes are to be picked but not for measuring sugar in wine. Now how are we going to measure residual sugar in fermenting wine in a commercial setting. One of two methods seems to be primarily used. For a reading that is plus or minus a percentage or two there is the hydrometer. Using the hydrometer’s specific gravity scale, tracking specific gravity will determine how quickly the sugar in wine is being converted into alcohol. All hydrometers are calibrated at 20°C, so measure the temperature of the wine and correct the specific gravity based on the temperature. The hydrometer should come with a temperature correction chart. Another risk to accuracy is measuring a must that contains lots of particles of skins or pulp. This will interfere with the measurement. Carbon dioxide can also push the hydrometer up in the graduated cylinder, so take the reading quickly if the wine is fermenting. Also as the wine gains alcohol this changes the specific gravity and affects the reading and so must be adjusted for. Again though a not very accurate plus or minus a point or two. To avoid the variable of alcohol there is a method that has you boil off the alcohol and replace with water. Time consuming and a pain, but a lot more accurate. Lastly it seems that the solution the the accuracy issue is to use a spectrophotometer. The spectrometer, enzymatic analysis of residual sugar is one of the best and most accurate ways to determine the quantity of sugar left in your wine and the method used by most if not all accredited labs. Last but certainly not least is the fact that printing labels a scheduling bottling takes time and often the labels are ordered prior to a good final accurate test (assuming one is done) is done so an 'accurate approximation' is put on the label. As it turns out this simple subject is not as simple as we first thought and as we discovered the answers are pretty much all answered with the precursor, 'it depends but generally speaking this is sometimes the general rule of thumb sometimes' kinds of non specific answers. So truth in labeling now comes into play. Struth this was supposed to be a simple answer to a simple question. Maybe the following will help! Here are some specific rules from the ATF Ruling 78-4 for your reading pleasure and some followup to it from the Code of Federal Regulations. After a few hours of chatting, and a few more to research and check some facts and terms, we have come to the conclusion of 'if we like it, who cares!' as all this stuff is giving us a brain ache! We are off to get a glass or three to clear our heads! 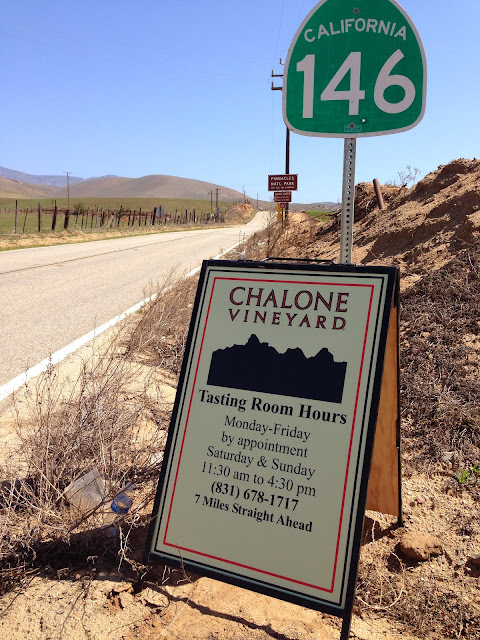 The famous Chalone Vineyards has recently reopened the tasting room on weekends and we could not resist a visit. 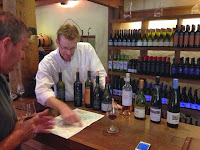 We tasted through their range of wines and found a number that were very nice. Now its a bit of a drive up to the tasting room so we took a picnic lunch with us and that was a stoke of genius as it was a spectacular day. The wine that got the honor of joining us for our picnic lunch was an attention getting and delightful Chenin Blanc. 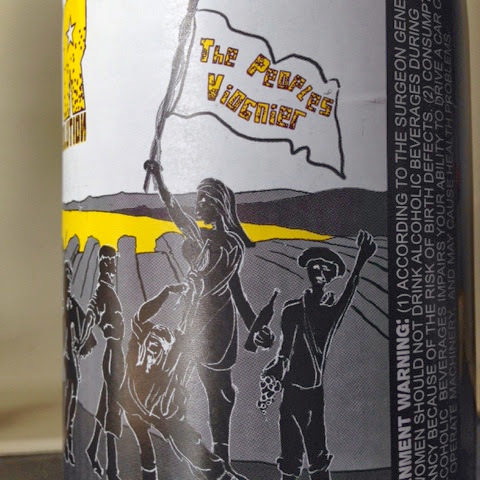 This Chenin Blanc was 100% whole cluster pressed and fermented in stainless steel and French barrels. It immediately catches your attention with its bright fruit as it is beautifully balanced. This wine is medium bodied, with a delightful and racy acidity and has great finish. This wine would make a delicious aperitif but would also go very nicely with everything from melon and prosciutto to chicken salad, Thai curries and spicy Mexican dishes and even a homely ham cheddar and tomato sandwich. What makes this not only a good wine but a wine of interest is the history. 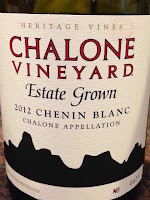 Here is some info from Chalone Vineyards. This exclusive bottling of Chenin Blanc comes from a venerable, head-trained vineyard planted in 1919 on our mountain estate. The synergy between old vines, unique terroir and the superb 2012 vintage created a truly amazing Chenin Blanc that brims with juicy pineapple and Fuji apple expression. Jasmine and mineral notes add complexity, while balanced acidity focuses the flavors and enlivens the finish. 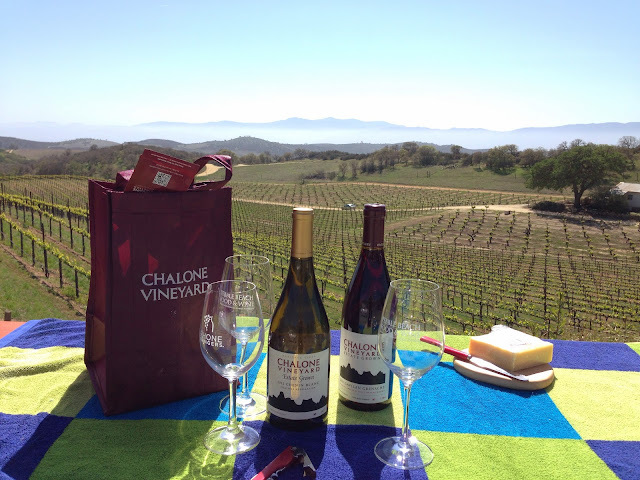 We all really enjoyed this wine with our picnic and rate it a 7 and $1 over ****. We subscribed to their newsletter and got 10% off wich brought it into full **** range. When in Rome there are a number of things that are just 'must do' sights to see and the Fontana di Trevi or the Trevi Fountain is just one of them. So there we were in the Eternal City after a couple years of planning. Luckily we were smart enough to have RomeCabs pick us up at the airport and deliver us, with an orientation tour of the city to get our bearings on the way to the Hotel Alpi, where we were staying while in Rome. You will not find any other place in the world that celebrates architecture and the essence of water with it's ever changing form and power like Rome. Ok, they tend to celebrate a lot of things in Rome, but fountains and water, is at or near the top of the list. The Trevi Fountain is a spectacular work of art that is much more than a mere fountain. This example of Baroque art with its soft lines and fantasy creatures is an amazing sight. The fountain is a true wonder, a jewel of water and stone that is nestled between the palaces of the historic centre of the city and it is one of the biggest fountains in Rome. Being lost tourists with a not to scale tourist map we discovered finding things is not as easy as it should be, but not all that hard either. Luckily as you approach the fountain you can hear its presence from the nearby streets. Once you get to the fountain you need to spend some time just hanging out, looking and listening and just trying to take it all in. Better yet you should get some pre-dinner, post breakfast or lunch gelato from one of the nearby gelaterias. Ah, the sound of the worlds most famous fountain and eating magical gelato while you sit on the steps is truly wonderful when not too crowded (read very early morning and late at night). The Trevi Fountain, or Fontana di Trevi in Italian, is Italy’s most famous fountain, standing 85 feet high and 65 feet across. The fountain can be found in Rome's Piazza di Trevi in the Quirinale district and is easily reached by bus, Metro or on foot as we did. The Trevi Fountain was designed by Roman architect Nicola Salvi. Construction began in 1732 and concluded three decades later under artist Giuseppe Pannini as Salvi's successor. The site originally marked the terminal at the Aqua Virgo aqueduct built in 19 BC. The central figures of the fountain are Neptune (God of the sea), flanked by two Tritons. One struggles to master an unruly "sea horse", the other leads a far more docile animal. These symbolize the two contrasting moods of the sea. One of the first storey reliefs shows a young girl (the legendary virgin after whom the aqueduct was named) pointing to the spring from which the water flows. The throwing of coins into the Trevi Fountain in Rome is a popular ritual that tourists from all over the globe just love to take part in and we could not resist the the legend. What if it is true? The practice of throwing coins in to the Trevi Fountain comes from a couple of legends that explain why so many people are so keen on coin throwing. The second legend was the inspiration behind the film “Three Coins in the Trevi Fountain“. This legend claims that you should throw three coins into the fountain. The first coin guarantees your return to Rome, the second will ensure a new romance, and the third will ensure marriage. The municipality of Rome collects the coins from the Trevi Fountain every day to prevent them from being stolen (they retrieve about 3k euros a day). They have created a fund in order to finance a supermarket for the poor people of Rome with the help of Italy’s Red Cross charity. The Trevi Fountain is one of Rome’s most well-known monuments and it became even more famous thanks to the film “La Dolce Vita” but The entire area around the fountain is steeped in history with incredible architecture. The trevi Fountain is just a wonderful sight to behold and we strongly suggest you visit during the day time and at night, as they are two very different experiences that you 'must do' while in the Eternal City. Sometimes the things you hold special in a wine come together to give you just what you want. This weeks #ww or #weekly winner or #WednesdayWine gave exactly what we needed. 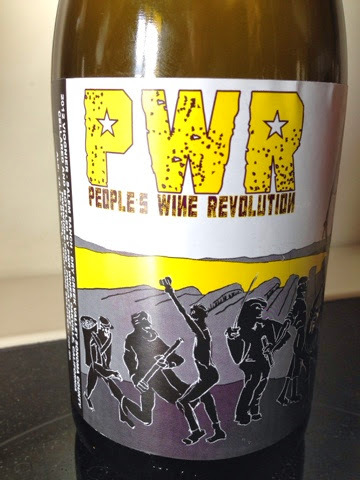 The Peoples Wine Revolution Viognier 2012 is 100% Viognier from the Salem Ranch in Sonoma's Dry Creek Valley. It has a lovey perfumed nose, with subtle notes of jasmine, apricot and sweet almond. This nicely balanced wine is medium-bodied with a medium long finish. A nice example of this versatile wine. They harvested the grapes on September 27, 2012, at 25.6° Brix, pH 3.67 and 5.1 g/L titratable acidity. The grapes were gently pressed and the wine fermented slowly in a neutral vessel and they bottled 122 cases on February 18, 2013. 14.1% alcohol, pH 3.40 and 6.5 g/L titratable acidity. This is a wine that is much more than the sum of it's parts as is typical of the PWR wines. 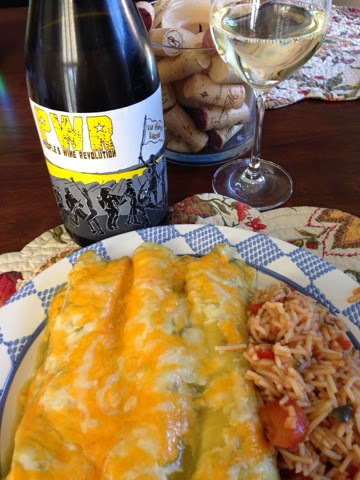 It was paired this week night with chicken enchiladas and it was very complimentary. The perfect wine for the night. Their motto is 'Ruling class wines at working class prices!' and this they deliver with their wines batting well above their price point. This one we rate at a 7 and ****. Seek them out and find the ones you like and consume! 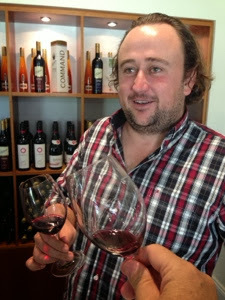 Last year we visited the Yalumba folks down in Coonawarra and absolutely fell in love with the area and the people. 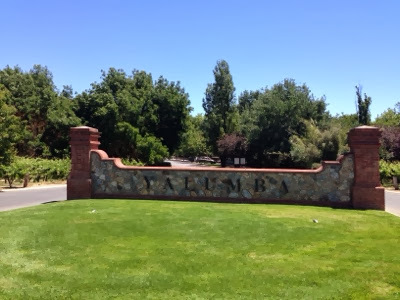 Communication was originally through the Yalumba office in the Barossa Valley who put us direct contact with the wonderful people down in Coonawarra. 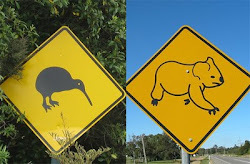 An area everyone should visit. With the great service and help received we felt it was mandatory that while visiting the Barossa Valley we pay a visit to the place that helped start it all, and to meet and personally thank the person behind one of the great wine trip Adventures. With a history that dates back over a hundred and sixty years and being the oldest family winery in Australia there is a lot to learn about Yalumba. "Founded in 1849 by a British migrant and English brewer, Samuel Smith, who had brought his family to Angaston seeking a new life. After purchasing a 30-acre parcel of land just beyond the southern-eastern boundary of Angaston, Smith and his son began planting the first vines by moonlight. Samuel named his patch "Yalumba", aboriginal for, "all the land around." Five generations later, in 1985, under the guidance of Robert Hill Smith the success story continues. Click 'here' for an interesting history timeline. What a great place to visit and have a taste. Not only are there great wines to taste in an amazing historic facility, there are the wonderful people of Yalumba there to to take you on a wonderful tasting journey. The wine lineup is very nice and worthy of a visit even without the amazing facility and wonderful people. 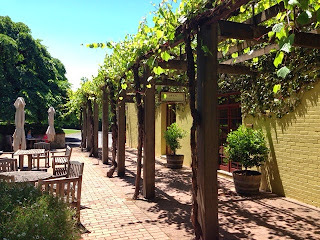 We took the time to enjoy a great tasting of Yalumba's fine wines in one o the coolest (wow, great, neat, nice, interesting and comfortable) tasting areas you could visit. 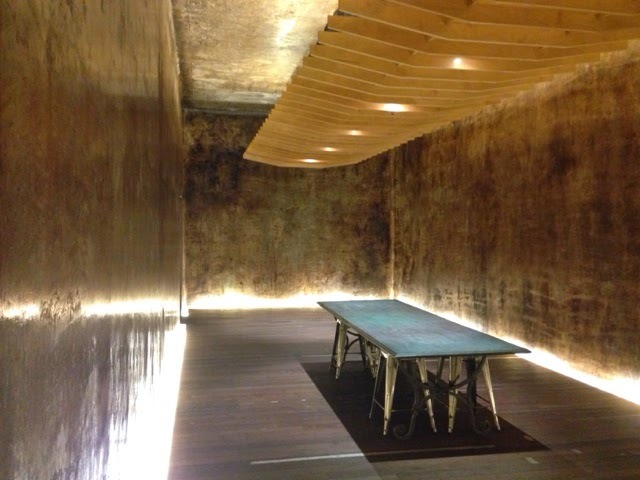 The tasting area is in the building that was once Yalumba's Brandy Bond store and reflects the true authenticity and feel of this winery that is over 150 years old. After we were done (think they caught on to the multiple revisiting) Steve Linder took us on a tour of the facility. This place has some truly neat places hidden in these amazing old buildings. One of the things that stand out is the pride in the history and accomplishments of the company in Steve's words. As we go into places and see things that not too many get to see it is also apharent that Yalumba takes its history and responsibility to it very seriously. The upkeep and the preservation of these amazing facilities takes a significant commitment and everywhere we went it was very well taken care of. Even the conversion of a couple very large old concrete fermenters that are no longer used, into a Yalumba VIP tasting area. Stunning! We even got to hang out where the Ashes players came to have a tipple on the rest days (not much resting, wink wink). 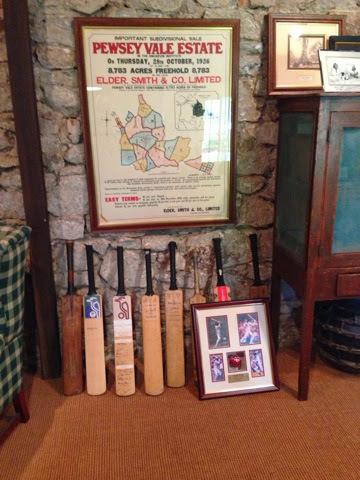 The space is decorated in all sorts of wonderful cricket memorabilia from bats and balls to autographed photos of many of the greats. Thanks to Steve and the good people at Yalumba for making our visit such a wonderful experience and for taking the time to share what a great place and company Yalumba is. Next time in town maybe a glass with Robert! 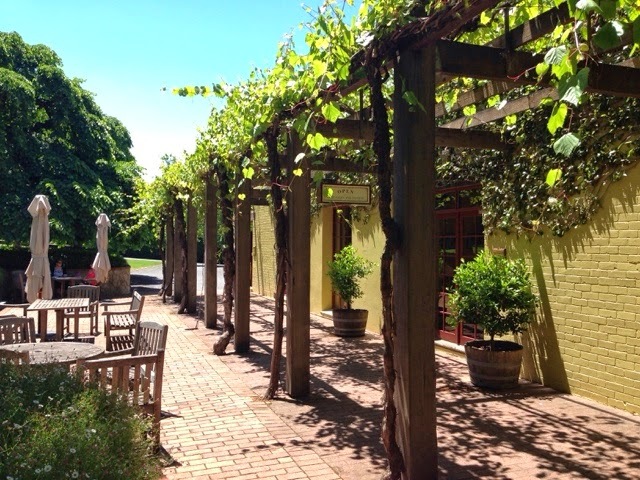 For the cool place and the lovely wine this place is highly 'recommended' as a place to visit in the Barossa Valley. 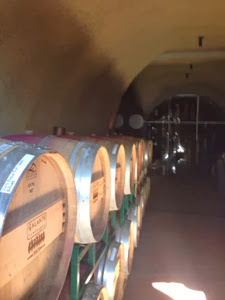 Fermentation is in stainless steel tanks and under controlled temperatures, and then aging in French oak barrels for about 7 months before bottling. Alcohol is a fairly low 13% and the color is a lovely deep ruby ​​red with lovely notes of dark fruit and flowers. It touches the palate with cocoa, spices and vanilla and has a nice complexity of taste. With good structure and with soft tannins evident but nicely rounded it’s a nicely balanced medium bodied wine. This wine bats way above its price point! 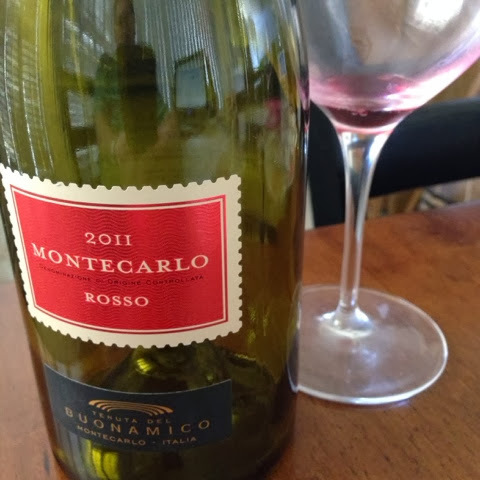 A fabulous #WW wine that we feel is a 6-7 and **** and perfect for any day of the week. 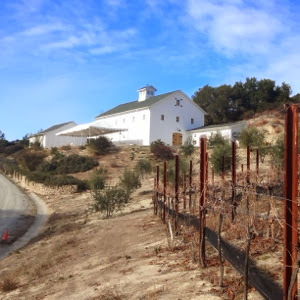 Its that time of year in California when the pruning of the vines is undertaken. This annual vineyard event arguably sets the stage for the coming vintage. The pruning of the vine determines how many canes grow and that has an effect on the amount of vine growth which in turn affects the number of bunches of grapes each vine produces. Prune a grape vine correctly and you will increase the quality of the crop. There are numerous methods used to prune and train grape vines, but the philosophy is the same. Pruning prevents the vine from growing too much foliage, which in turn, amounts to not enough fruit or if done incorrectly can lead to too much fruit of less flavor. A well-pruned vineyard allows for the right amount of sunlight and air circulation and these factors create an environment that is less likely to allow diseases or pests to take hold. 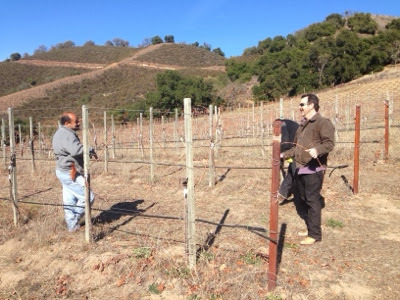 We thought a close up look at a local vineyard would be nice so after a fortuitous meeting with Jack Galante, an appointment was made and we were set. 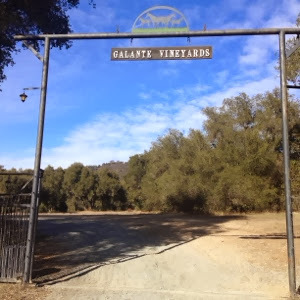 The vineyard to be visited is the Almond Flat Vineyard of Galante Vineyards deep in Carmel Valley. At this site there are 700 acres with 60 acres if vineyard area but only 25 currently under vine. They have removed some older early planted vines and are preparing to replant when conditions seem best (currently under severe drought). 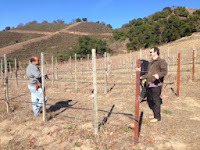 I met up with Jack at the winery office and it was off up the hillside to the Almond Flat Vineyard where we were to meet Vineyard and Ranch manager Eliud Ortiz to take a look at how he prunes. The Almond Flat Vineyard is one of highest vineyards in the county at 1800 ft and is planted in Pinot Noir, Sauvignon Blanc, Viognier and Petit Sirah. One of the questions we had was how do you choose when to prune? The answer was not direct, as with all operations in the wine business there are many factors, but for Eliud he tries to prune as late as possible before bud break. 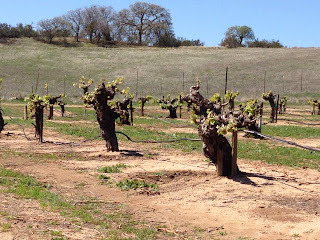 Some time about early March -April depending on vineyard and varietal with higher vineyards typically going into bud break first., so keeping a close eye on the vines is paramount. Each varietal is pruned a little different but generally pruning to achieve a yield of 2-3 tons per acre. 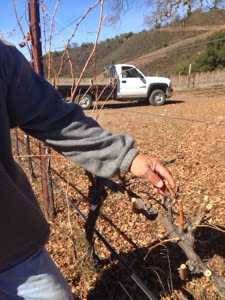 With grape clusters being different sizes each vine varietal is pruned to deliver that amount. 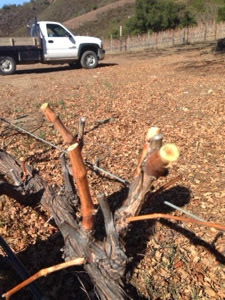 They generally start the pruning with Sauvignon Blanc then move through to Viognier then Pinot Noir and last Petite Sirah. After pruning they put the wires down and as the season progresses raise the wires for canopy management. The Sauvignon Blanc is what we played with this day and for this varietal they do spur pruning. The vineyard is planted with vines in a 3 foot spaced row with rows planted 8 feet apart. Eliud prunes back to to 12 spurs of two buds for a total count of 24 buds with each bud new growth comes with each producing two clusters of grapes. It takes approximately a full day to prune 400 Sauvignon Blanc vines and for an older Cabernet Sauvignon a pruner may only get 200 completed. Depending on the year there is always ongoing work in the vineyards. Each season brings its own character and can increase or decrease the amount of TLC needed. Whether it's leaf pulling, suckering, ground crop management, pest management, if or when to irrigate (in a drought year like the current one) or determining when you need to net to keep the birds from eating your crop, the work never stops. Eliud estimates that on average it takes at least 30 minutes per vine annually to keep a vineyard healthy. With a hand maintained vineyards like these in this area there are approximately only 2-4 bottles of wine per vine and with that amount of TLC you will never see a $10 bottle produced. With that being said that sounds like a good idea for another article. This video is Eliud showing us the way. Please help Eliud get back to the ranch. 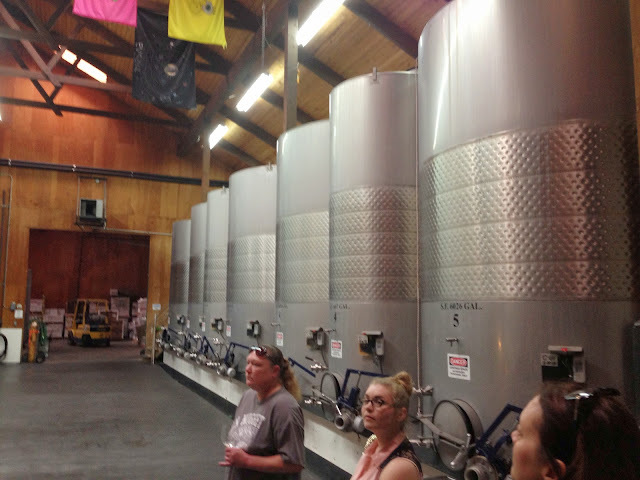 Thanks to Jack Galante of Galante Vineyards for taking the time to show us around and clue us in a little bit. After talking and watching all this work, for Eliud its back to work pruning, but for us its back to the drinking. This weeks #WW is not your average wine to drink midweek at the dinner table. It is a big step up. The selection is from Scratch Wines in Soledad California. 2011 Scratch Pinot Noir. 14.2% alc., pH 3.71, TA 0.65, 35 cases, $45. Pommard 4 and 667 clones. 50% whole cluster. A downright lovely Pinot Noir, that uses grapes from the KW Ranch Vineyard and dishes out medium-bodied notes of raspberry, cherry and darker style fruit, a little pepper and mineral to go with a smooth, polished and beautifully textured profile on the palate. It is balanced in acids and tannins, with a nice long finish and has that hard to define je ne sais quoi. This is an exciting inaugural Pinot Noir from Sabrine Rodems, and we are looking forward to the next release from Scratch Wines. Totally enjoyed this wine wine oven baked lamb chops with asparagus and roasted potatoes. Giving this wine a 7-8 and ***. 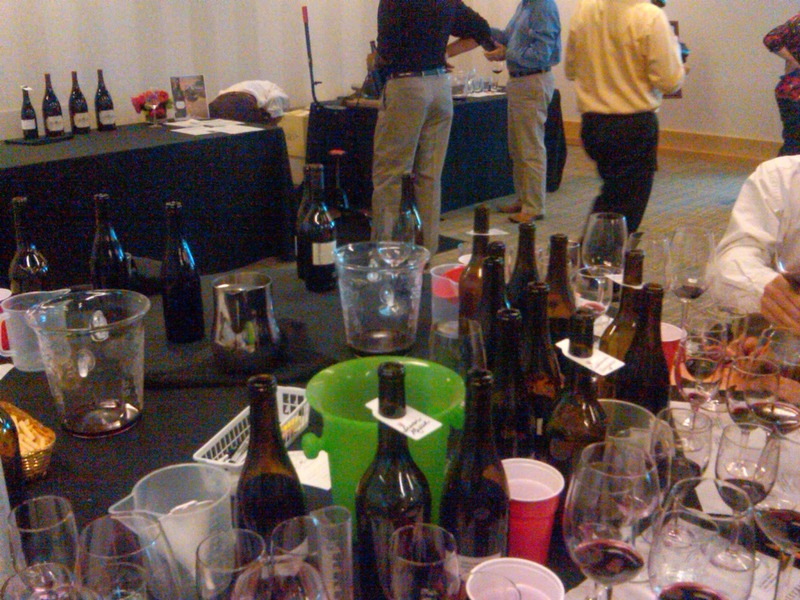 Enjoy your weekly wine or winning wine or wine Wednesday or just simply the #WW. 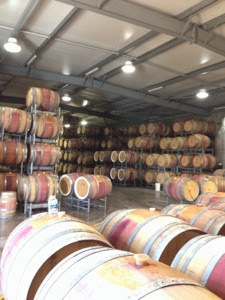 While reaching out to wineries in the Barossa Valley on a recent trip, one of the those we connected with was Elderton Wines. What a wonderful connection it turned out to be. 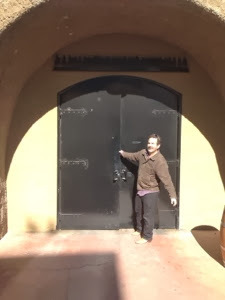 Some places have good wine and some places have nice cellar doors. 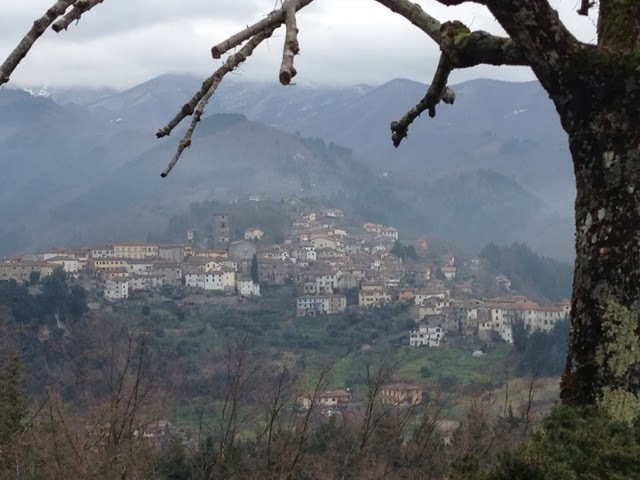 Some will have interesting vineyards and some will have history, even a place to stay perhaps. A few will even have some combination of these things. Very few have most of these things and fewer still have all of them. At Elderton they definitely fit into the later category. One of the wonderful things about the wine industry are the stories. The stories of the evolution of a businesses. Stories of a time when previous generations made tough choices, took big risks or had a vision that others of the time did not have. In every bottle is a potentially wonderful heartwarming story of passion, of hard work or heart break, sometimes dumb luck, sometimes good luck and yes Elderton Wines has all of these and even a couple stories that will tug heavily on your heart strings. 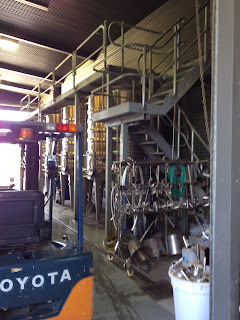 We had arranged to meet at the Cellar Door at 9am and get the day started from there. I walked to the Cellar Door from where I was staying at the Elderton Lodge about 300 meters down the road and found Co-managing Directors, Cameron and Allister Ashmead sitting on the front porch finishing their coffee's of which they immediately offered to get one for me. The Cellar Door manager Tush Steinert was on it, and a great coffee shop quality Cappuccino was soon served up. While enjoying the delicious Cappuccino we chatted and got to know each other a little bit. You may wonder how with a last name of Ashmead they are running a family winery caller Elderton. Well let me try to tell a long story an shorten it up a bit. 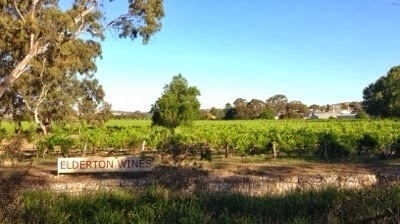 The estate vineyard was planted on the property in 1894 was named Elderton. It was successful for about 80 years but was let go derelict in the mid 70s (typical of the area in that time). The family Ashmead with Neal and Lorraine forging the way purchased the distressed property in 1979. It was 1982 before the first wine with the Elderton Label was released. 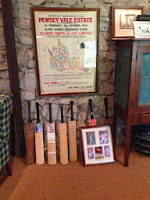 The family business got a shot in the arm in 1993 when they won national acclaim after winning the Jimmy Watson Trophy. Tragedy struck in 1997 when Neil died tragically at age 50. Lorraine was placed in the role of chief executive and decisions had to be made about the future of Elderton. She could have easily thrown it all in. She didn't! In 2000, Lorraine's eldest son Allister joined Elderton and was followed in 2003 by younger brother Cameron. During this conversation of the history and story of Elderton is when one of the great wine stories was told. The Ashmead boys in an effort to show their love and appreciation of their mum wanted to do something big for her 60th birthday. Mum was not going to have it. She even took a trip from Australia to New York to make sure they could not pull off any surprise. They somehow figured out where she was eating her birthday dinner with a friend at and had a bottle of wine delivered with specific instructions to the restaurant to only open the sent bottle no matter what she ordered. What wine was so special you wonder. They put together a new label 'Ode To Lorraine' to honour their mum. It was a huge surprise given she had refused to sanction the idea time and again. The thought was beautiful, the execution amazing and a great story. Oh by the way it is also a great wine. Get some! I did! After a while we drove through the estate vineyard on the way over to the head office and into the wine making facilities where we ran into Richard the wine maker. A tall affable bloke who likes a good laugh and it seems is up for about anything. After some laughs Richard was back to work as was Cameron and Allister and I continued to look over the facilities. They have a lot of the usual suspects with Stainless steel tanks but also have a series of very cool open top concrete fermenter tanks. While looking at the concrete tanks from the elevated walkways a massive grey spider the size of a Labrador was standing menacingly on it's hind legs on the handrail just behind me, lunging at me with it's vampire fangs. Lucky for me Allister moved me away before I knew what was behind me otherwise it would have been shear panic. I would have thrown my upper body backwards, while my feet continued to stay put, catching on a little too late, resulting in something that makes me look like the victim of a slide tackle pushing me feet first under the gigantic spider with my arms flailing and me screaming like a girl as the beast leaped down and consumed me. Ok perhaps a little dramatic but probably not far from the truth, at least the panic part. Thanks for the calm save Allister. 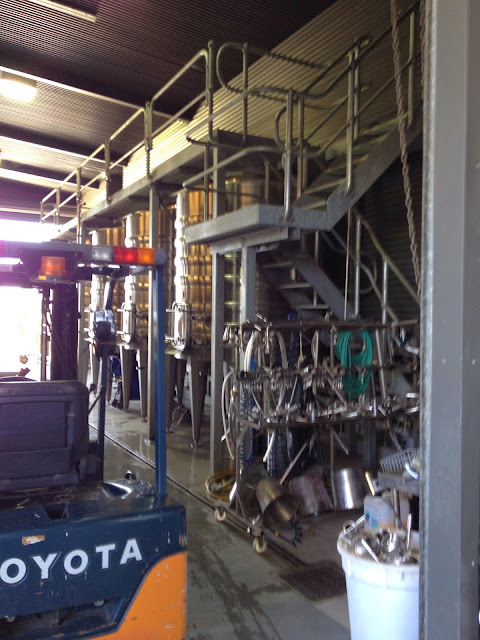 From the crush, press and tank area we walked alongside the famous Elderton Vineyard which dates back as far as 100 years and past the house where Cameron and Allisters Mum, Lorraine now resides to the barrel warehouse. This is a state of the art insulated temperature controlled facility with approximately 800 barrels stored here. The Cooperage they use is a local with a ton of history by the name of A.P. Johns. Think a visit may be in order. 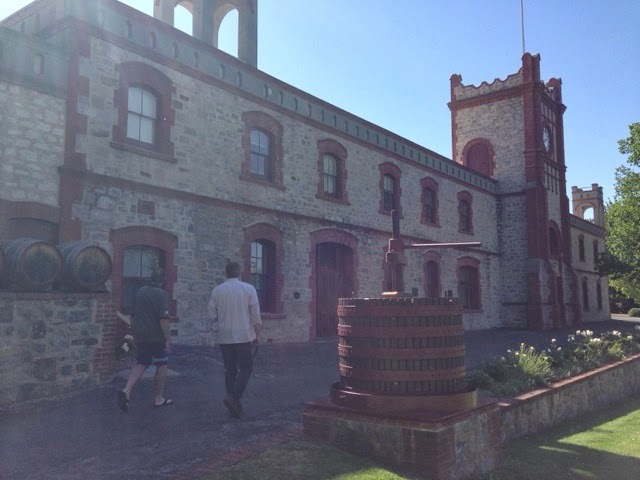 The John family began operating as coopers late in the 19th century when Christian Paul John established what was then the Chateau Tanunda Cooperage in 1889. His son, Arthur Paul John (who the business is named after) continued in his father’s trade, establishing the original A.P. John cooperage on the current Chateau Tanunda site where it operated until moving to the current site in Tanunda in 1925. AP John Coopers range of French and American Oak Barrels can be found in the cellars of premium winemakers throughout Australia, New Zealand, South Africa, California and Spain. 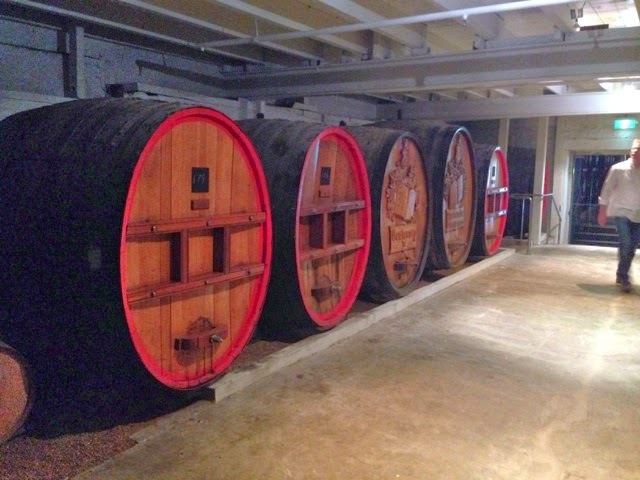 From the barrel storage building we walked back to the cellar door to taste a selection of Elderton wines. Allister talked and tasted with me through a range of Elderton wines starting with delightful Riesling from their Eden Valley vineyard. This light aromatic drop was the perfect starter. While this vintage is sold out the 2014 is due for release in May 2014. Next up was the Eden Valley 2012 Marsanne Roussanne. This was the first release of this Rhone blend and they hit it out of the park (hit for 6). I tasted through the Eden Valley 2012 Chardonnay, Eden Valley 2011 Shiraz, Elderton Barossa 2010 Zinfandel, Western Ridge Barossa Valley Grenache Carignan, Elderton Barossa Cabernet Sauvignon 2010, Elderton Barossa Shiraz 2012 all truly nice wines at very good prices, mostly **** and a couple low *** bottles. Very impressive line up. 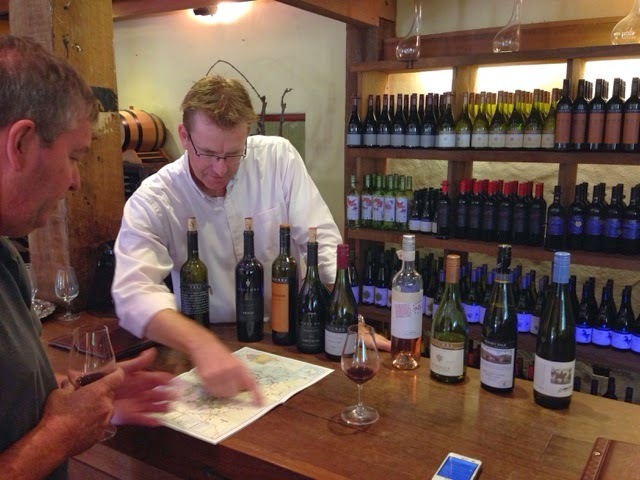 But wait we were not done, Allister was about to shift into top gear (pun somewhat intended) as he poured the 2010 Barossa Valley Niel Ashmead Grand Tourer. Wow this was a great drop. First released from the 2008 vintage, the Grand Tourer Shiraz is named after and produced in honour of Elderton co-founder, Cameron and Allisters father, Neil Ashmead. Neil was a ‘Barossa Road Warrior’ like none before. Driving tirelessly from city to city with his car loaded with wine, doing tastings and dinners with whoever would listen, and talking up the Barossa. It was his love of fast cars that made this process a little easier and so the unusual choice for the name of this Shiraz. Great drop. Next up was the 2009 Ode To Lorraine. 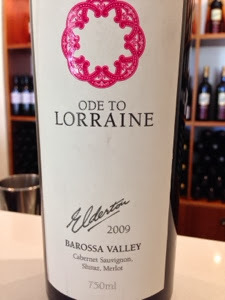 The Ode to Lorraine is a blend of the finest barrels of each of the Elderton Estate varietals. The wine making team at Elderton believe this is truly the hidden gem in the Elderton portfolio of premium reds and based on it's *** price I would agree. A fantastic blend of 66% Cabernet Sauvignon, 25% Shiraz and 9% Merlot, the 2009 Ode to Lorraine has a deep garnet-purple color and giving generous purple fruit characters, spiciness and generous length. Brilliant (purchased one of these. Loved the story and the wine). The last of the reds to be tasted was the Iconic Command Single Vineyard Shiraz 2009. The vineyard that this wine is made from was planted circa 1894, classed as a centenarian block by the Barossa Old Vine Charter and is one beautiful Shiraz. 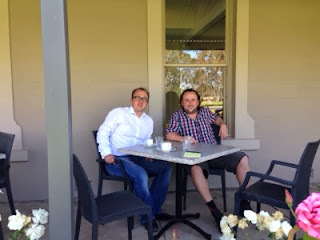 Allister and Cameron had explained to me that as the current custodians of this rare piece of Barossa Valley viticultural heritage, it is their mission to continue their parents aspirations and expectations and to produce a truly great wine. The Command is an expression of place, and one which the family intends to preserve for generations to come. This is a great wine that delivers in splendid fashion. Well done boys! The tasting finished up with the most delightful 2012 Golden Semillon. This is a wonderfully fruit sweet dessert wine that will have you coming back for more. One well know wine writer from Australia summed it with one word, Yum! I could not agree more Winsor. Thank you so much to Allister and Cameron for their generosity and sharing of their time and wine. The telling of company history and sharing of wonderful family stories. 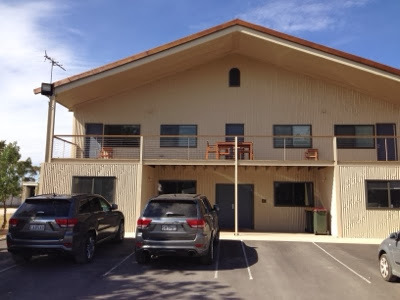 The use of the wonderful Elderton Lodge which was a perfect base while visiting the Barossa Valley. 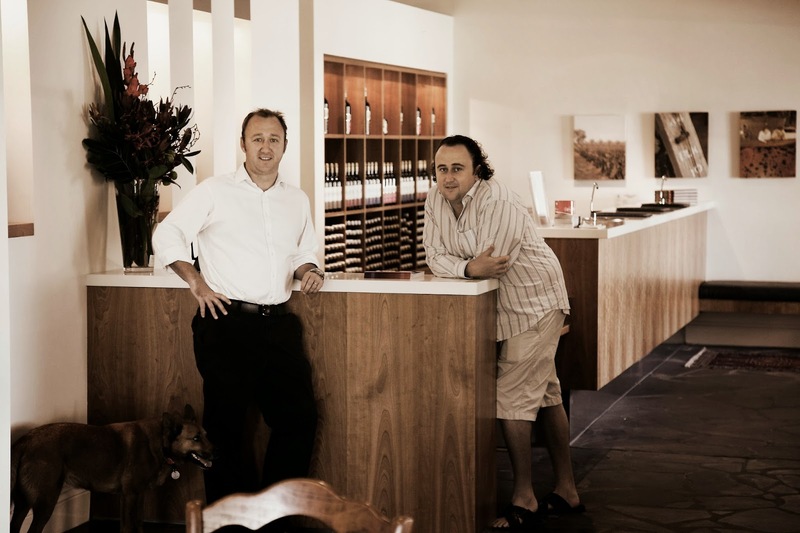 A couple of top blokes who have great wine and a lovely cellar door that you need to visit. While you are there say g'day to Tush. Better yet, book you and a few friends to a Master Class Tasting at the Cellar Door and experience some great Australian Wines, let me restate that, some 'truly great wines'. We highly 'recommend' you do! Ran into Cameron and Allister at Adelaide Airport when they were on their way to Asia to meet with distributors and got to say g'day again. Thanks again guys! Cheers!